In her nominating statement for the 2014 Neustadt International Prize for Literature, the Ethiopian-Italian author Gabriella Ghermandi wrote passionately about the work of fellow African writer Mia Couto—in particular, his gift for recolonizing the Portuguese language by infusing it with the richness of the more than two dozen oral cultures of Mozambique. Ghermandi argued that, even though we live in an age of hyperspecialization, the great writers, while writing about their homelands, are also able to communicate to the entire world. While presenting her own nominee for the Neustadt award, Ananda Devi also urged the jury to choose a writer who knows what it is to suffer, in this age of disintegration, and can feel deeply our common humanity. And in an eloquent observation on behalf of his candidate, Fady Joudah described writers as “the last generalists of desire,” those individuals capable of illuminating our cultural conversation and expanding the worlds we have in mind when invoking the notion of “world” literature. 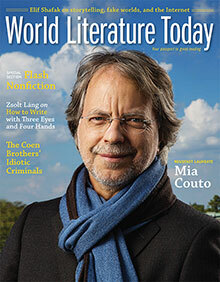 In this issue of World Literature Today, we celebrate the jury’s ultimate decision to select Mia Couto—truly a writer who communicates to the entire world, feels deeply our common humanity, and remains a “generalist of desire”—as the winner of the 2014 Neustadt Prize (page 48). When Couto visited the University of Oklahoma in October 2014 to accept the award, he gave generously of his time to all who took part in the Neustadt Festival celebrating his life and work. Notably, over a thousand students heard him give a bilingual reading from his latest novel (Confession of the Lioness, due out in English in May), watched a moving dance adaptation of his story “The Birds of God,” and listened to his keynote talk, “Re-enchanting the World” (included in this issue). 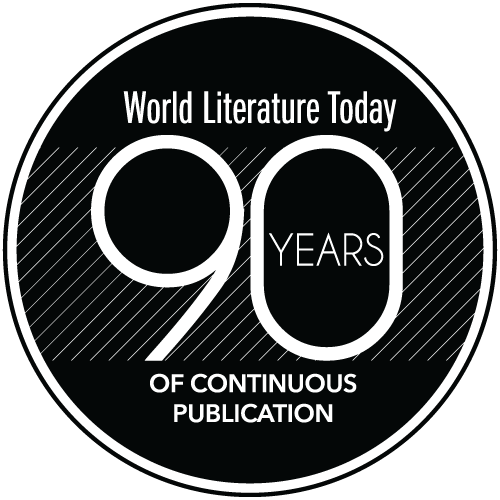 Inevitably, students—and aspiring writers in general—are always eager to ask established writers for advice; in response to their questions throughout the week, Couto offered the following guidelines: (1) since we are made of stories, we must first listen to the voices of others and fall in love with their stories; (2) to make sense of the world as something other than our own reflection in the mirror, we must then imagine ourselves inhabiting those stories; (3) after inhabiting that other world, writers must return some of that magic back to the world in the form of new tellings. In a vivid analogy, Couto explained that if you wish to see stars in the night sky, projecting your own light will make them invisible; in the same way, writers who “disappear” in their narratives enable “the presence of those who seemed absent”—namely, the stories of those whose voices are rarely heard. In an essay entitled “What Africa Does the African Writer Write About?” (forthcoming in a collection called Pensativities this spring), Couto describes himself as “a traveler of identities, a smuggler of souls”: “The writer isn’t just someone who writes. It is someone who produces thought, someone capable of pollinating others with feeling and delight.” With words like thought, feeling, and delight, Couto immediately invokes the aesthetic imperatives of Horace’s “Ars Poetica.” A poet at heart, Couto is no jaded postmodernist; rather, in the words of Niyi Afolabi, he remains a “revolutionary optimist,” as in his poem “Numbers”: “Giving life to the dead / is the work of infinite gods. // Resuscitating the living: / just one love accomplishes the miracle” (page 59). For Mia Couto, storytelling not only makes us human, it resuscitates us from the living death brought on by our baser instincts and shelters writers—and readers—from the violence and fear that dehumanize us all. Visit neustadtprize.org for a full list of all the 2014 nominees and jurors.